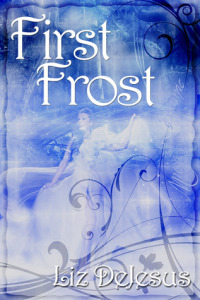 Today, I'm visiting with Liz DeJesus, author of First Frost. Her novel blends fairy tale and fantasy, but adds a modern twist. I read and reviewed her novel last week and I loved it so much, I asked her to answer a few questions. I hope you'll read her book. I think you'll love it as much as I did. Tricia: Thank you so much for agreeing to speak with me about your book. Can you tell us a little about yourself? Liz: My name is Liz DeJesus, I’m an author as well as a stay at home mom to two beautiful little boys. J I was born in the tiny island of Puerto Rico and when I was seventeen I moved to Delaware. I’m the author of Nina, The Jackets and First Frost. I’m currently working on the sequel to First Frost, which is titled Glass Frost. I’m also a new member of The Written Remains Guild. L: I started writing really young, but I didn’t take it seriously until I was 18 years old and decided that I wanted to be a novelist. I had a few misses but eventually I found my stride and got published. T: How did you come up with the idea for First Frost? L: I was watching a commercial for a local children’s museum while feeding my son his bottle and I remember thinking ‘Why don’t they have themed museums? Like a pirate museum or a fairy tale museum. Hmm, how would that work? I guess they could get fake items and get kids to think they’re real.’ And then it sort of took off from there. It was almost like being struck by lightning once I got to thinking about it. I was still holding my son in my arms and my notebook was on the other end of the couch. LOL I was so desperate to get to it but I didn’t want to interrupt my son’s feeding. Anyway, I managed to grab my notebook and I jotted down a few ideas. It sort of wrote itself once I had the pen in my hand. T: Is fantasy the only genre you write, or do you write other types of novels? T: I'm a mom of teens, so I'm very picky about characterization. When teens are written unrealistically, I stop reading. You did a very good job with your characters. Is Bianca based on someone you know, and if not, how did she evolve. L: Awww shucks. Thank you so much. I try to make my characters as real as possible…I like giving them imperfections (Bianca is nearsighted and needs glasses every once in a while to see), and other quirks. Because those are the types of things that people have. When I created the character of Bianca I tried to imagine a modern day Snow White and then I threw in some of my sense of humor (Bianca is a smart-mouthed teenager). Basically, Bianca is who I wanted to be at seventeen. I’ve already finished the sequel to First Frost (titled Glass Frost) and she does evolve. She starts to take life much more seriously and she’s matured a bit. But all of the characters grow at their own pace. T: Was it difficult to weave the fairy tale elements with modern times? L: It was tricky. Because when Bianca has to use magic in the real world she has to be very careful not to get caught by random people. But when she’s in Everafter (the magical world where the fairy tales took place) she’s much more relaxed and feels like she’s in her element. It’s safe to say that she’s much more comfortable in Everafter and that of course comes into play in the following books. T: Excluding Bianca, who is your favorite character and why? L: Oh wow. I love all my characters. But if I had to choose? I would have to go with Ming. She makes me laugh with her snarky comments and witty observations. She’s an extremely loyal friend and while she’s terrified of what’s happening, she does her best to stand beside her friend. We could all use a friend like Ming. T:. What do you hope readers will take with them after reading your book? L: I just hope that they enjoyed my book. My main goal with my writing is to have fun and to entertain the reader. T: Liz, thank you again for joining us today. I can't wait to read Glass Frost. Please let me know as soon as you have a release date. :D Awww, thank you so much. And thanks for stopping by to read the interview. So happy to hear that you enjoyed First Frost. :) Can't wait to be officially finished with Glass Frost so I can submit it to Musa.